Energy markets are prone to an obscure, confusing, and even contradictory web of subsidies and taxes. Often, the extent of this web depends on how one defines a subsidy or tax, and how far you are willing to dig. Certain energy installations, like wind, are extremely dependent on subsidies. Wind installations drop to almost nothing every time the production tax credit lapses. Utility-scale nuclear benefits from federal disaster insurance guarantees. It is probable that utilities could not be persuaded to build nuclear without this safety net in the face of catastrophe. To oversimplify, a tax is a charge on an individual or corporation (legal entity) that is paid to the government, while a subsidy moves dollars in the other direction. This is of course not entirely accurate, and ignores instruments such as fees. Essentially, taxes allow the government to collect revenue to pay for goods and services that would not be covered by a fee-based system (like passports or the DMV). Roughly, subsidies can be indirect or direct. An example of a direct subsidy is the production tax credit for wind, while the nuclear insurance guarantees are more of an indirect subsidy, in that the program makes nuclear development more palatable as a whole, without a direct outflow of cash. Background aside, my goal here is to identify a hidden energy tax* on American drivers. In this case, I had the notion that US-imposed sanctions on Iran may be acting as a subsidy for oil-producing nations, and a tax on American drivers. This is possible due to the global nature of oil markets and the fungible nature of crude oil itself. In case you missed it, there was an announcement of a deal with Iran to formally make a deal in 6 months. While the details of this current arrangement seem somewhat amorphous, with John Kerry and Iranian officials issuing some conflicting statements,what I'm interested in was the $3 price drop in Brent crude following the announcement of the deal. Bloomberg quoted analysts who referred to this price drop as a " 'knee-jerk' " reaction. While the price did recover by the end of the day, it is reasonable to view that $3 drop as something of a price premium that futures traders are allocating to increased Iranian production, and re-involvement with OPEC. Despite the price stabilization, there is still a long road ahead. If all goes well on the deal-making front, Iran could be involved in high-level OPEC discussion by next summer, and is expected to push back on Iraqi exports while ramping up its own. However, Iran faces a series of technical challenges in restoring capacity and re-opening old production. Additionally, Iranian wells have been producing for longer than many Iraqi fields, and it is possible that they will never reach 3 million barrels a day, but remain between 1-2 million. With that background out of the way, let's move on to my original idea- that US government sanctions are costing American drivers at the pump. Right away I had to see if there was a clear-ish relationship between the price of crude and the price of gas at the pump. Brent crude prices are the standard which other hub crudes are priced against, so I grabbed the EIA's weekly data on Brent spot prices as well as the data on average gasoline prices. The history on gasoline prices averaged across all blends doesn't start until April, 1993 so I cut off the earlier Brent prices to match this 20.5 year span. I chose to use the averaged prices because I'm looking for broad trends, nothing fancy or subtle. A double y-axis plot would show if there was any hint of a relationship, so I started there. Immediately apparent is that the price of Brent Crude and the price of gasoline track extraordinarily well against each other. From this point I tried to find $3 price fluctuations to match the price premium that could be attached to free-flowing (free as it gets with OPEC) Iranian oil. I can't look directly at the most recent change for two reasons. The last week's data isn't even out yet (it releases tomorrow I think). This price change occurred in a single day, and as traders came to understand the deal the price returned to nearly the starting value. In order to generate more data to work with I opened it up to a 50 cent range. I found 38 weeks using change ranges from +2.75 to +3.25. Before I continue, I should come clean: This is a pretty terrible way to carry this analysis out, but I'm 2 weeks from graduation and should probably not spend days developing a more comprehensive model. There is no paucity of nuanced modeling of oil markets and the effects of regulations and treaties. This is more of a thought experiment on my part, and a rough one at that. 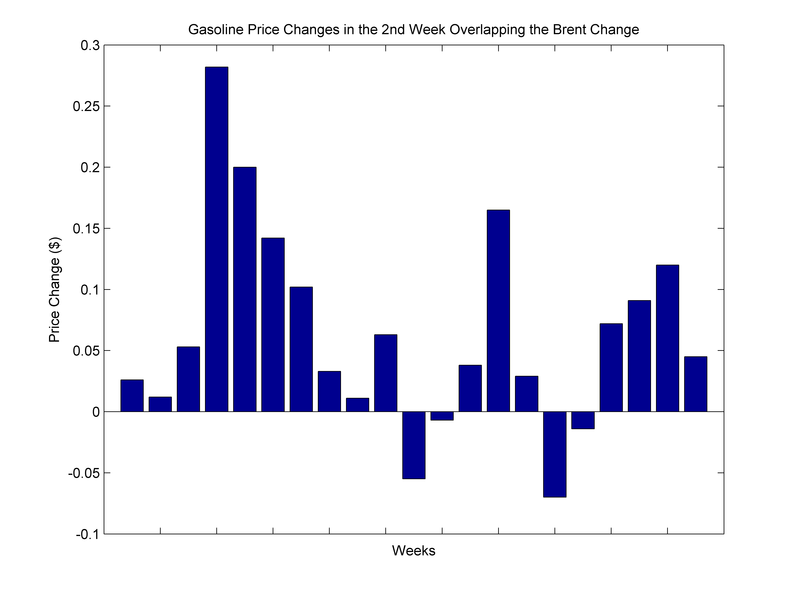 So with these 21 Brent price changes in hand it's time to take a look at gasoline prices in the weeks around each change. 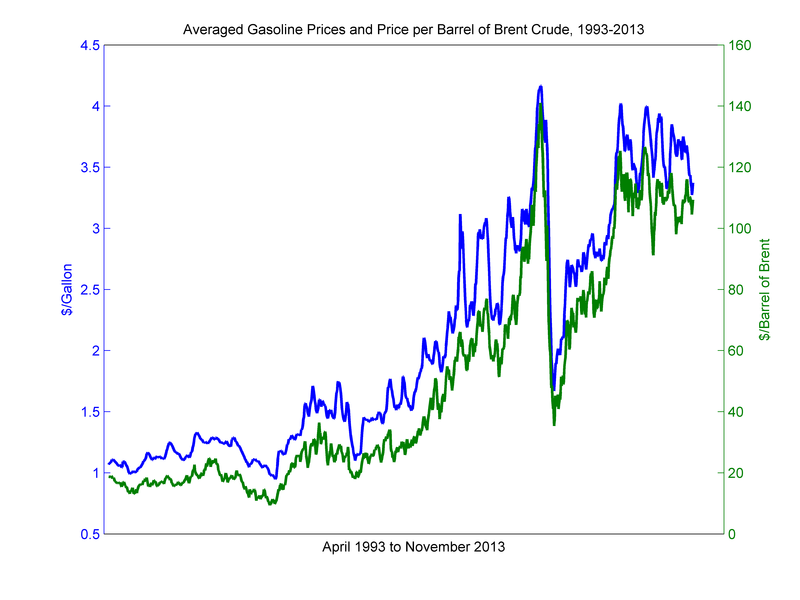 Here it's important to note that the Brent and gasoline weeks are slightly offset. Each Brent week starts 3 days earlier than the corresponding gasoline week, i.e., the gasoline data begins April 5th and the Brent data starts April 2nd. This 3-day gap isn't necessarily a bad thing, because it's easy to take the gasoline prices from the 1st and 2nd weeks relative to the single Brent week. Gas prices should lag at least slightly behind crude changes, so the second week is more likely to capture change in gasoline prices as a result of changes in Brent prices. 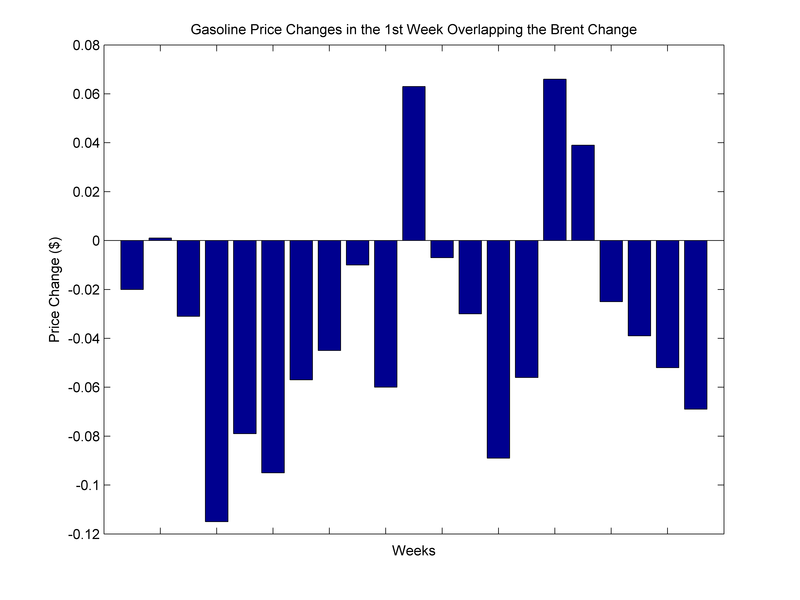 To meet my expectations the 1st week can have essentially any change, and as the price signals reach gasoline the 2nd week should display increased price. Those last few sentences are a bit confusing, so here are the results in graphical form. The mean price change in the first week is -0.0338. The mean price change in the second week is +0.0637. In 2011, the United States consumed about 134 billion gallons of gasoline. Granted, this price is mostly borne by drivers. Those who don't own cars and bike, use public transit, or just walk (my preferred method of locomotion) will avoid most of this cost. Most goods are transported via diesel, and public transit is normally powered by natural gas, diesel, or electricity. With those assumptions, how much does each of those drivers pay? Going back to the wellspring of EIA data (table 58) we find that there are 120.77 million gasoline-powered internal combustion engine vehicles in the United States. These vehicles account for the vast majority of gasoline use so for this (again, very simple!) analysis we'll say they're the total consumers. Of course, not all ICE vehicles are created equal, and the actual amount of this Iranian Sanctions tax charged depends on the amount of gas someone purchases each year. Another way to look at this is through the best-selling cars and their mpg ratings. 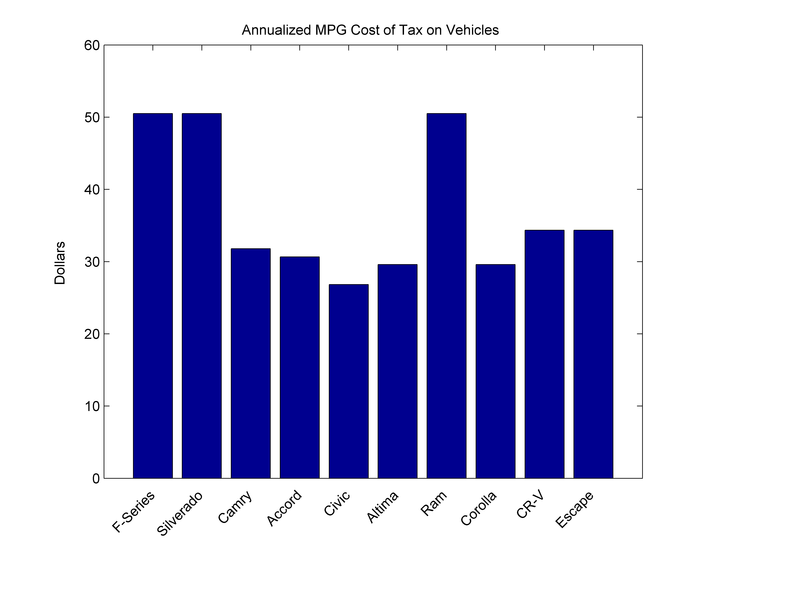 This data is from goodcarbadcar.net (sales) and fueleconomy.gov (mpg). In some cases I attempted to roughly average the mpg of vehicles reported as a series (eg. the F-Series). For all starting mpg values I used the combined rating of the 2013 models, although I know 2012 sales does not necessarily mean 2013 models. 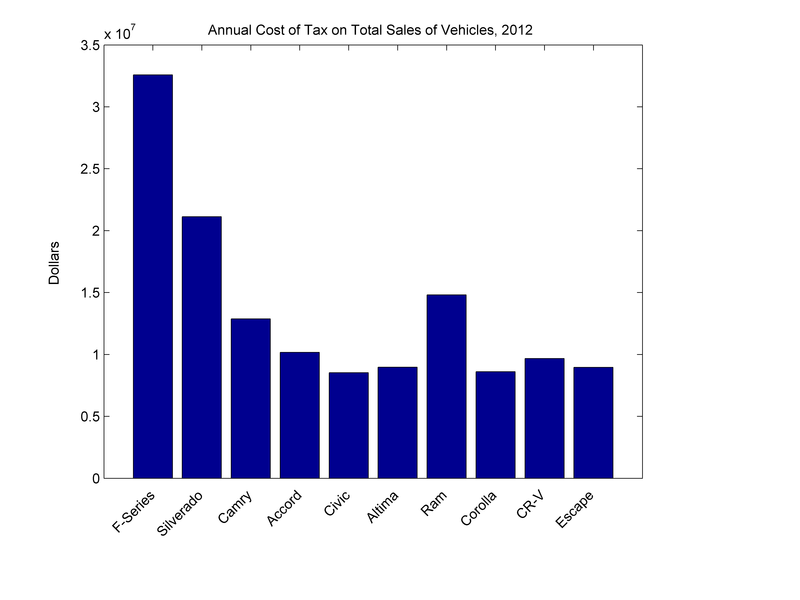 Finally, I used Department of Transportation numbers for the average annual mileage of American drivers (13,476 miles) to create an index of tax for these cars and trucks, and find the annual cost to that group of sales. and for easy-to-view values here are bar charts of the last two columns. I find it intriguing that despite the differences in mileage, the top-selling cars in America are close enough that it doesn't make a huge difference in the annual price to the driver, with the range only slightly exceeding $20, the cost of a somewhat cheap meal out for two. Here, the trucks stand out because of their poor mpg. The Dodge Ram series may sell less than the Camry, but a Ram's mileage is sufficiently worse to ensure a higher total Iranian Sanctions tax burden. Trucks paying a higher at equal mileage levels is interesting in light of survey results from Strategic Vision which found that Republicans were most likely to own trucks, and recent polling has found more Republicans in favor of continuing sanctions than other political affiliations. While I haven't proved anything conclusively, I think there is value in demonstrating the potential for hidden taxes in energy. Particularly when it comes to a charged foreign affairs issue, and the rapid way in which prices can react and change to news. It might be the case that there is no longer a price premium for Iranian oil sanctions, but the potential effects are still worth investigating. There are a lot of fun things to do with the price of oil and oil derivatives due to both its ubiquity and international nature. Hopefully, I can start integrating more current events into these posts. By the way, the $8,535,800,000/year number I came to is not just a tax on American drivers, but also a subsidy to oil producers (which the US is as well), in that if it does exist it keeps the price (and profits) artificially higher. It was fun to take a step away from the EIA-860 form data, but I'm still going through energy sources there. Next on my plate is geothermal. * Yes, this isn't exactly a typical tax. I was thinking in terms of national oil producers. This cost premium keeps prices higher for them, and so in a way they are extracting a tax on gasoline consumption. Obviously a large chunk of this is captured by corporations, but this was my attempt at being evocative. There are also cases where specific taxes go to pay for specific programs. I think this could be viewed as a similar case, the money's just skipping a step. UPDATE: Changed Tax in title to Cost to be more accurate.